Your corner retreat overlooks the lake and The Links Course which will go very well with your first cup of morning coffee or a relaxing evening beverage with friends. We suggest both. We also hope you'll take extra time to enjoy the refreshing pool just a few steps away, or the sandy beaches of Miramar Beach a short walk or golf cart ride away. After coffee, you can tee-off within minutes at a nearby course. 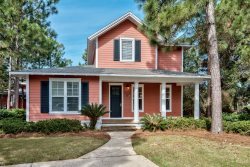 Your condo is next to The Links Golf Course, and Sandestin has several additional courses to play. Spend a day or a whole fantastic weekend of great golf courses at Sandestin. To check rates and availability at each course, call (850) 267-8155. For those non-golfers in your group, the community pool is steps away, and for you beach lovers, a morning beach walk is just a golf cart or bike ride away! This condo is also near The Village of Baytowne Wharf with opportunity for shopping, restaurants, live music, or just watching seagulls at the marina. 2 Bedrooms, 2 Bathrooms and Beautiful Views! This corner-unit condo is appointed in calming colors of the sea, and has plenty of space to entertain family and friends. And the chef in the house will enjoy the granite countertops, stainless steel appliances and breakfast bar and dining table, perfect for preparing a delicious meal of local fresh seafood. Each bedroom offers coziness, cool tones and a flat screen TV. We were delighted with the accommodations. The kitchen was more than adequately furnished and the golf cart was perfect for getting around. Thanks for a wonderful week. Beautifully decorated unit in great location. Owners went above and beyond in furnishings and unit was spotless. We come to Sandestin several times a year and typically stay in different locations but would love to revisit this unit next time if available. Nicely updated condo, quiet corner unit, everything provided. Our family of 5 had the perfect vacation and look forward to returning. We will most definately stay in this unit again. We loved the location to both the bay and beach yet being away from crowded high rise condos. Thank you for a restful vacation! It was everything we expected, it was beautiful and clean and we loved seeing the turtles every morning! We chose this property for our family's spring break trip. The beautiful beachy colors caught my eye in the photo and the condo is even prettier in person. It's very clean and spacious. Easy booking and checkin! This is a very family friendly community! The pool is a few steps away, and while at the pool we enjoyed fireworks from the Baytown Village. We drove to Baytown Village for the most part. With our girls (ages 8 and 9), the village was a 20 minute walk from the condo. It's a beautiful walk and lots of friendly people to pass along the way. We drove across to the beach everyday since that would be a 20 minute walk with lots of stuff to take. The spring break crowd on the beach was nice! No crazy, obnoxious teens! Beautiful pool on the beach, snack stands, snow cones, yummy restaurant... A resort feel on the beach! We like it better than Seaside! I downloaded the sandestin app since we had never been to the area. Also, the workers from security to the wait staff were so helpful with directions and info! Next time, we will take bikes and rent a golf cart!